I love Instagram. I love feeling like I’m part of someone else’s dinner when I see other home cook’s uploaded pictures. I love feeling excited when the “ding” pops up that a celebrity chef liked one of my pictures. I love when another user asks for one of my recipes. Yet I still have plenty of moments where I shake my head. Such as, when I look through pictures of users who are on Weight Watchers. They have usernames like WWjen or WWfoodlover … all of them start with “ww”. Anyway, I scan their photos and most of the time I see healthy meals, small portions, point tracking, and updates of their weight loss progress. A recent WW person started following me and I took a peak at her photos. Corn dogs, chili covered fries, ice cream sundaes, fast food french fries, fried seafood … the list goes on and on. This lady did her point tracking but her meals were disgusting! Who thinks a corn dog and a side of chili fries is healthy? I guess a corn dog is 2 points and fries were like 4 … she had some left over points and made an ice cream sundae, topped with whip cream and chocolate sauce. What that heck is she not learning from WW? She had other photos of her “progress”, usually the screen shot was something like “come on, you can do it … the points are adding up but you’re still struggling to lose weight”. NO KIDDING! She would tag the photo with something like #TailgateWeekendFail or #ICheatedThisWeek. Sorry hun I’m pretty sure your 75+ photos are not just from a bad weekend or a few cheat meals. You can’t cheat the system! If you eat like garbage you body will become a wasteland. Cut out the junk, cheat ONE day a week so you don’t go crazy, start to work out (walking around the block for 30 minutes is a great start), and then maybe you’ll see weight loss. It’s obviously not guaranteed and everyone is different but it’s a good start. You won’t see a change if you don’t make any! 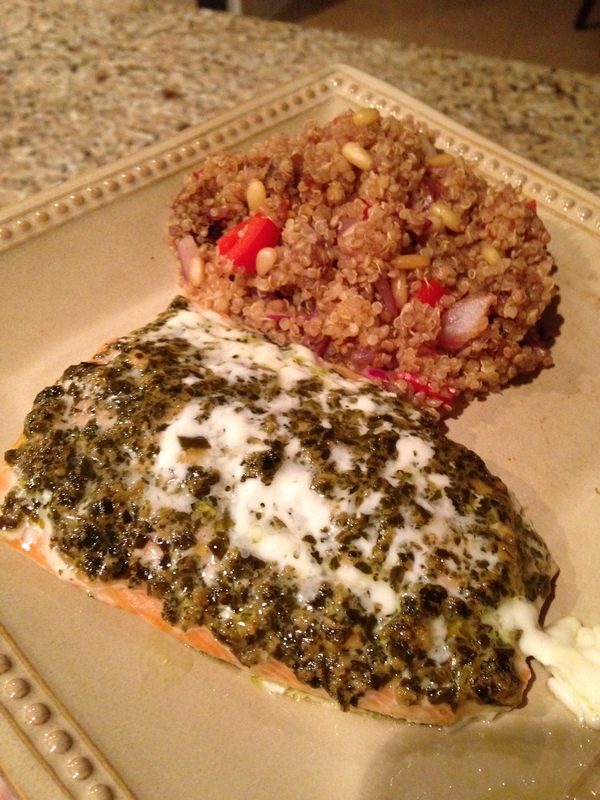 First up, pesto covered salmon with a veggie quinoa salad. Buy jarred pesto and slather that fish up! Bake for 10 min on 400 – done. The “salad” was prepped in the morning so all I had to do was reheat it after work. Quinoa takes 20 minutes to cook and it needs to be constantly stirred, the last thing I feel like doing at night. Anyway, chop a red bell pepper and red onion, (cook until veggies are soft), mix in balsamic vinegar, top with pine nuts – serve. PS the ‘white stuff’ on the fish is fat, don’t be grossed out. I buy frozen filets; 1. 4 pieces = $12 (2 fresh filets cost that) 2. I don’t have to deal with the skin 3. My fridge doesn’t stink like fish. Sounds like a big bonus to me. 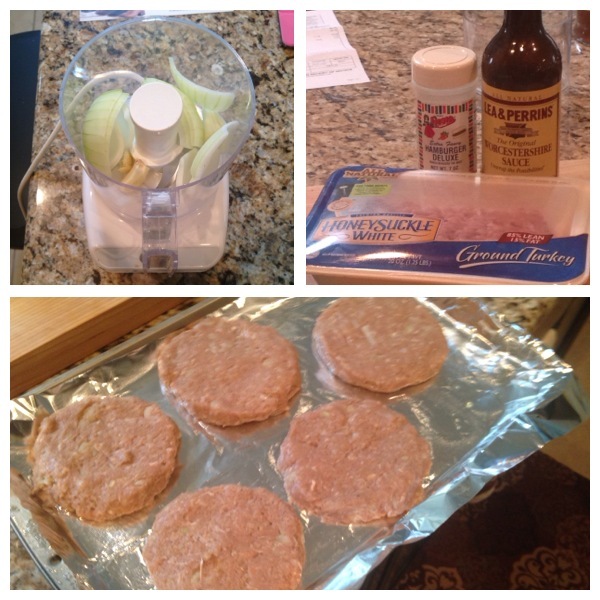 Next, turkey burgers! Cut the beef y’all, do yourself a giant favor. If you get the “fatty” turkey then you may be able to trick the meat lover in your family however don’t quote me on that. 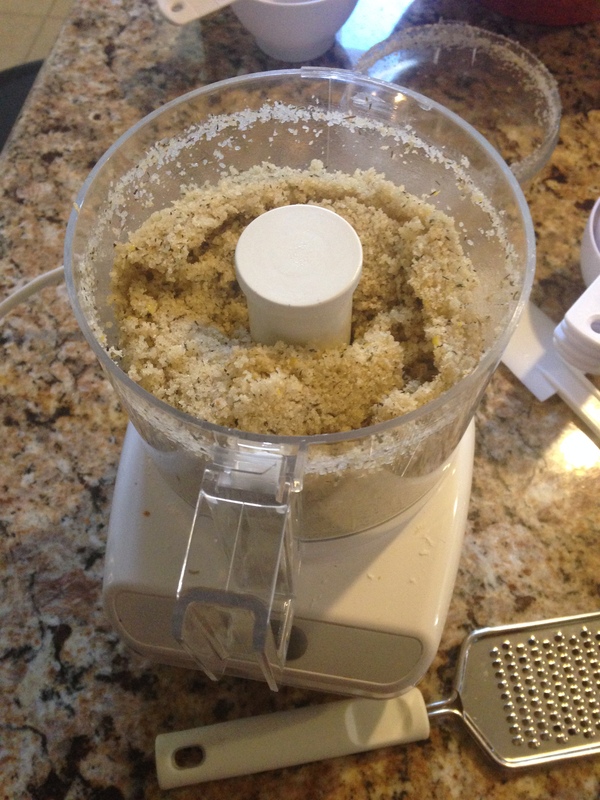 Ok so the burgers – bust out your food processor and toss in an onion and garlic. The juice of an onion is a great way to add moisture to turkey burgers or any burger for that fact. Added to the mix, wor. 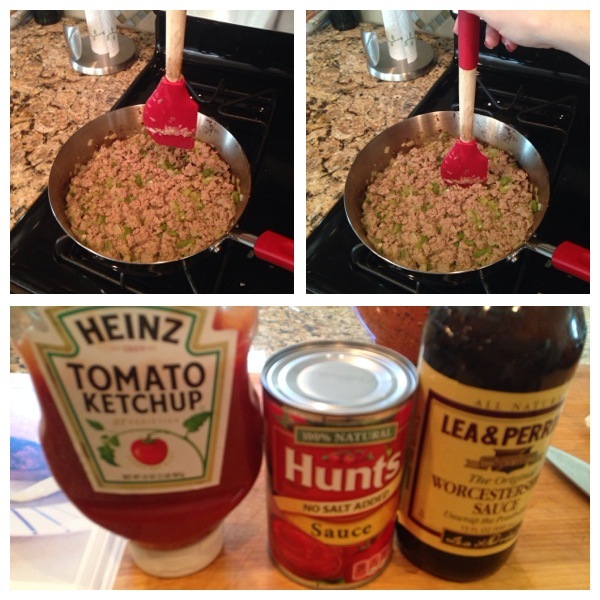 sauce and Fiesta burger seasoning. Crucial. 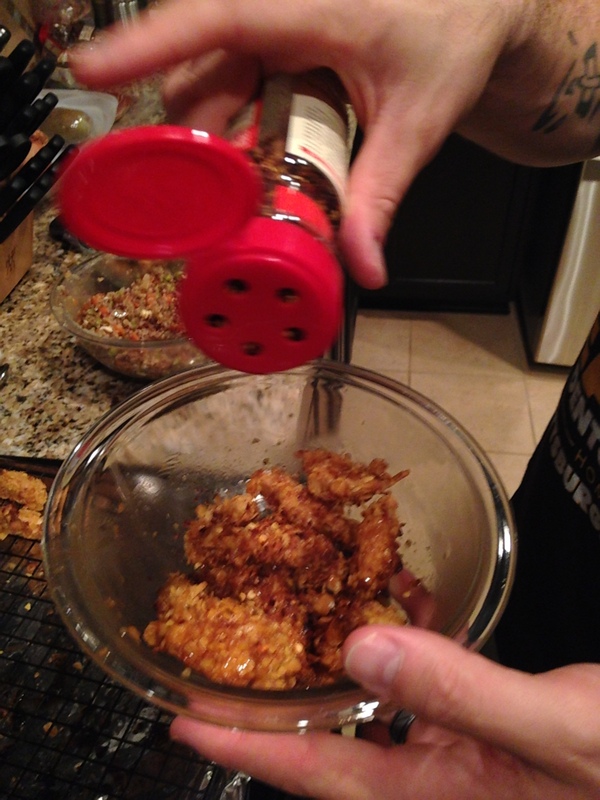 I love the flavors and with the food processor no one got large bits of anything, it was pulverized to perfection. With 1.25lbs of ground turkey I made 5 burgers, 2 small ones for me and 3 bigger ones for my husband. I ate 1 and he at 2 which meant leftovers. I’m finally getting the hang of this! I forget what our sides were but you could do a salad, baked sweet potato (better than regular), cole slaw, corn, peas/carrots, etc. Nothing greasy! Don’t forget a whole wheat bun; slower releasing carbs compared to white bread. 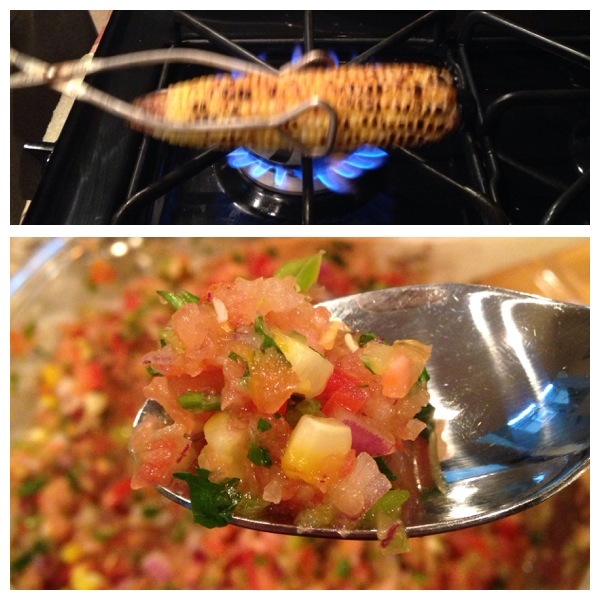 A fun weekend activity: we made salsa. I have no idea how to can so that’s on my bucket list … because we have a mega tupperware filled to the brim of fresh salsa. It’s not perfect, it was also our 1st attempt but it’s yummy. My husband added roasted corn which was necessary for sweetness with all of the acidic ingredients (tomatoes, cilantro, lime juice, onion). We all love take out right? Of course! Do yourself another favor and make your favorite meal at home. Our test was general tso’s chicken. 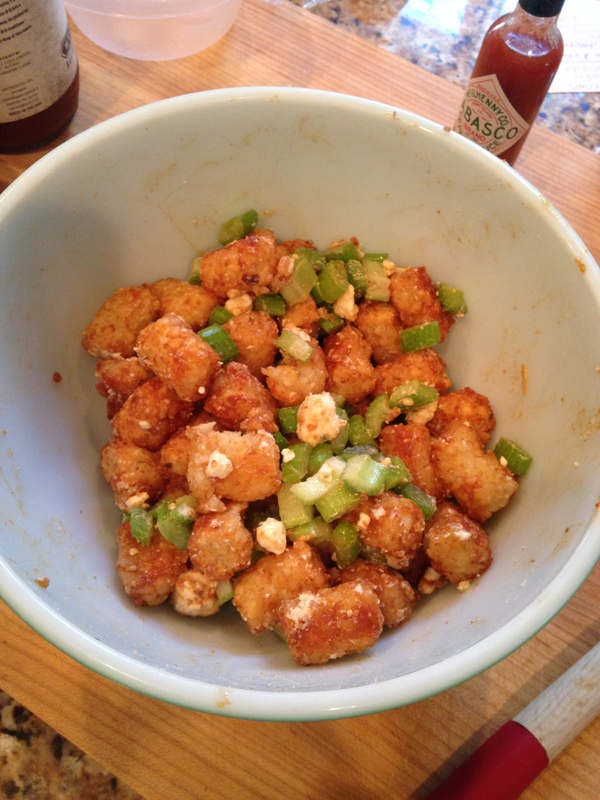 I found this awesome website Damn Delicious and found a recipe for a lighter version of this favorite “Chinese” dish. I say that with quotes because you should know that is an Americanized menu item. Made with corn flakes and just absolute yumminess, this will be a keeper! We loved it – paired with quinoa fried rice and not only did it feel like we called in this order but we felt good afterwards. You know how you feel after ordering take out – BLOATED & full of regret. Not with this dish! It was a bit time consuming but my husband helped and we cut the prep time down. I don’t like spicy food so he added red pepper flakes directly to his bowl instead of the sauce. We have at least 1 serving leftover. This could work for anyway, serve your plate and hide the rest! That way you won’t be tempted to go back for seconds or thirds. 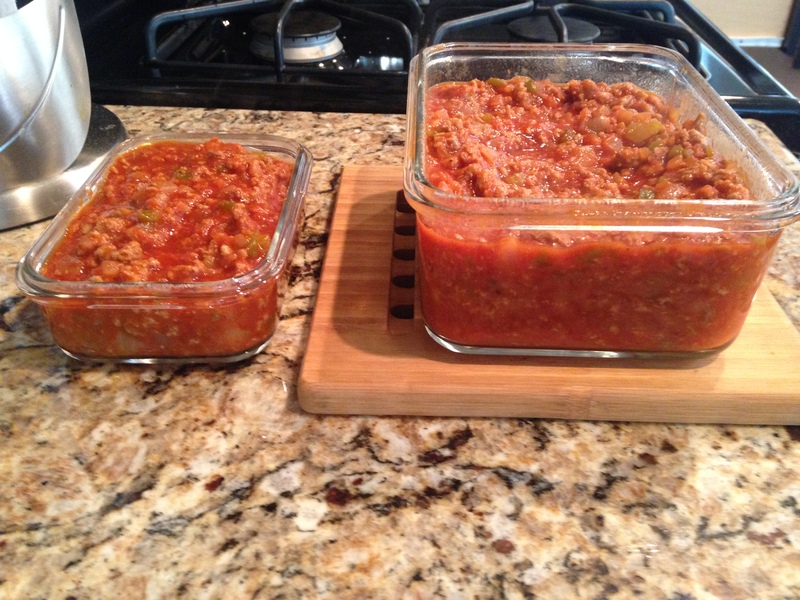 Back to the meal – sloppy joes. I freaking love Martha Stewart. This week is all about my favorite cook book, Great Food Fast. Easy recipes to follow, simple ingredients, and minimum prep/cook time. I prepped this one in the morning, again making an easy reheat for my 1 hr time slot for dinner 😉 A recent discovery, all of the nutrition facts are in the back of this book! If you need to light that fire of learning how to cook you should buy this book. It’s the one I started with and love it. Again I used ground turkey to cut the red meat. 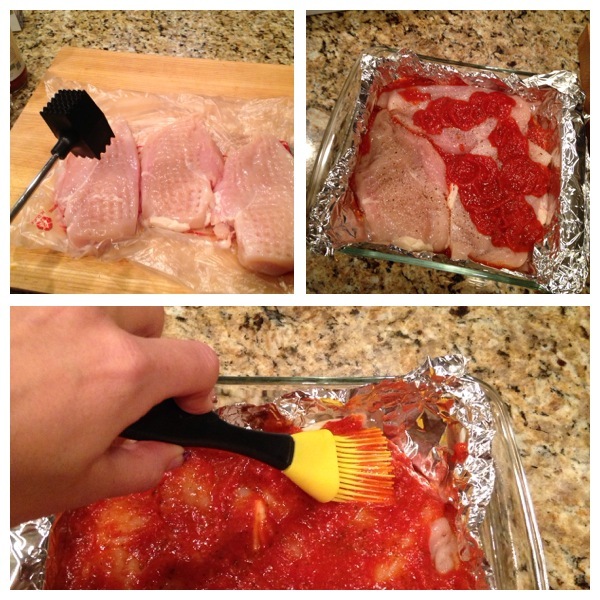 Make breaking up the meat easy, I use a rubber spatula and basically stab the you-know-what out of the meat, ha! Hold the pan with your free hand or you may have treats for your fur-babies. The meat gets super tiny and there aren’t any lumps. 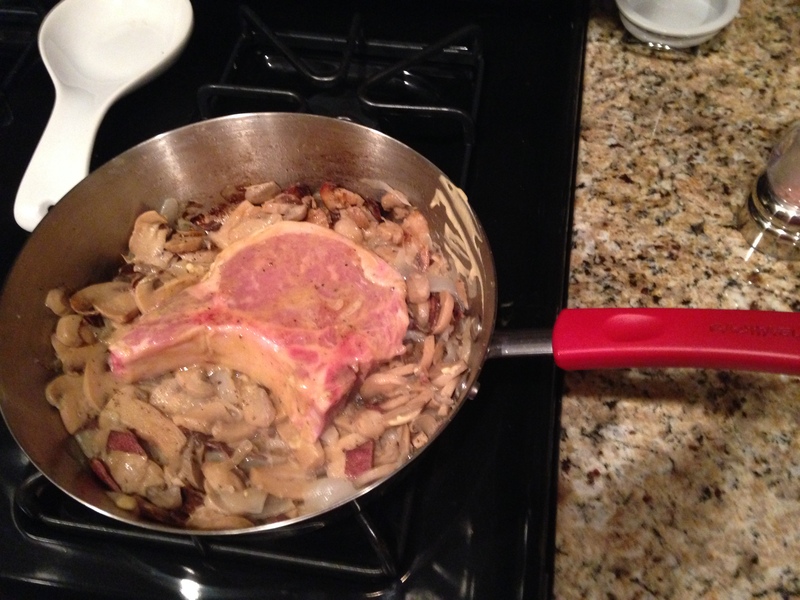 A wood spoon doesn’t get the meat broken up very well and half of the meat gets stuck to the spoon too. DO NOT BUY Manwich – that stuff if filled with nasty/bad for you ingredients. Make it yourself, hide those veggies, and you’ll never know the difference. Except you won’t feel like garbage afterwards. Hold on to your bloomers because this dinner was ready in a blink of an eye and it only used 5 ingredients. LOVE, LOVE, LOVE! 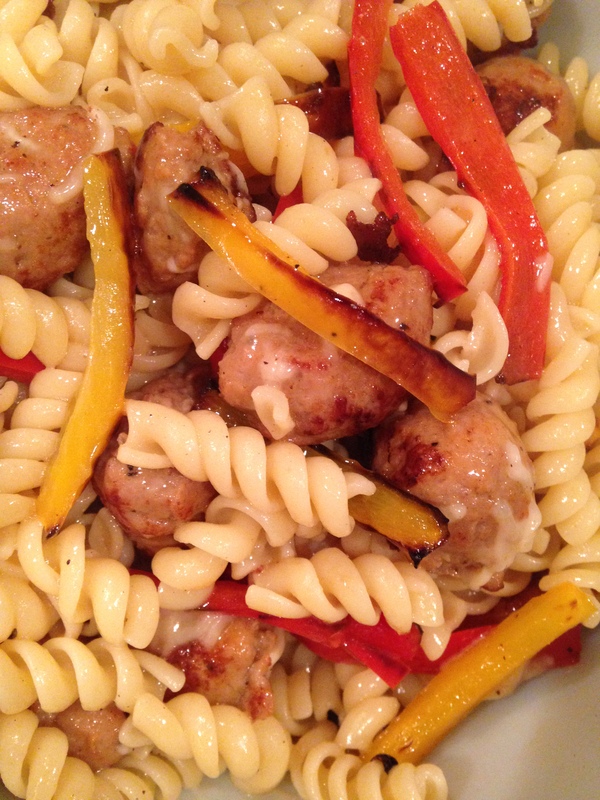 Red & yellow bell pepper, sweet Italian turkey sausage, pasta (we use Dream Fields, slow releasing carbs), Parmesean cheese, and butter (only 1 TBSP!!!). Seriously that’s it! The salty flavor of Parm. cheese and flavorful sausage will blow your taste buds away. Isn’t it funny how the simplest of meals can make you the happiest? Yes, a Martha meal. My husband was a bit skeptical of how it’d turn out but was pleasantly surprised 🙂 Martha does not disappoint! Trick or Treat, gimmie something good to eat! Last time I checked, you can’t eat pencils or stickers. 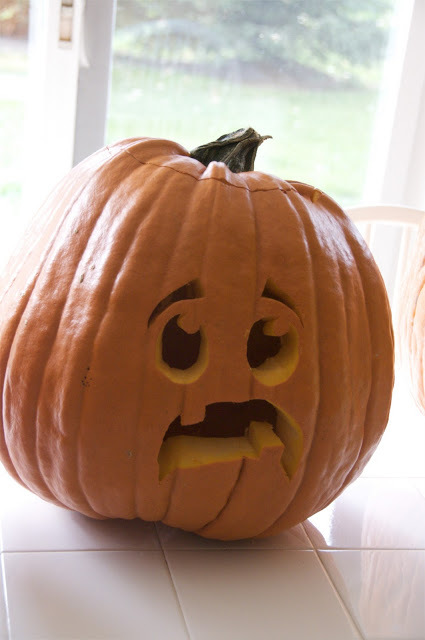 So what’s up with the teal pumpkin project? What happened to the days of dumping your candy bag on the kitchen table, mom/dad sitting with you as you searched for opened wrappers/tossed, things you couldn’t eat/tossed, and sneaking as many of the “okay” pieces as possible without your parents seeing? Go back to that first point … “mom or dad sitting with you” … In my opinion (after all this is my blog so I do get a say) parents have become lazy. They are relying on others to cater to their child’s food allergy; finding non-food items to pass out to those kids. I’ve seen some parents bragging about how much they’ve spent on fake tattoos, stickers, and pencils to pass out – some in the upwards of $40! Others promised to not run out (on food & non food items) and have bought enough goodies to fill 4 paper grocery bags. What the what?! Heaven forbid you run out and have to turn off your porch light; I bet these parents also believe that every child should win a medal. Back to my main point, I cringed at spending $12.50 on 5 bags of candy and being the teacher that I am I made sure to buy “peanut items” and “non peanut items”. Teach your kid to speak up or wear an allergy bracelet and I will gladly give them 1 of the non peanut items. FOR SHAME! Parents having to do their job! Just because we’re a ‘diabetic house’ doesn’t mean I’m going to pass out freaking pencils (or paint a pumpkin grey). NO KID WANTS PENCILS. The kids who are allergic to peanuts want candy too, as do diabetics (I’ll get in to nutrition facts in a second…). PARENTS: be involved and sort through those bags with your kiddos and stop expecting everyone to bend over backwards. Also teach your kids if porch lights are off that the house is not passing out candy, they’ve run out, or are not home. BTW this will be your kid’s face when you tell them they can only accept pencils on trick or treat night. **BEGIN CANDY NUTRITION INFO** this is for the other diabetics out there … it’s not as bad as I thought it’d be! … after reading all of these labels, yes that takes time but worth it when I get to tell my husband he can have some of the candy. Mind you 1 a day is all he can have but it’s better than nothing (it’s all anyone should have, let’s be real)! Now I’m not a candy lover but he’s the one who used to eat a mega bag of the “gold bag” gummy bears (this was pre-diabetes) so he’ll be happy that I’ve done my research. Most important though, have a safe and fun Halloween. Put on an awesome costume, carry a heavy duty candy bag, wear something reflective or a glow stick so you can be seen, and really – beg your parents to come with (probably suited for 6th grade and younger – middle school & older are just too cool to be seen with parents 😉 ). I was chatting with my husband about Halloween memories and we agreed that our parents stood at the edge of a driveway while we (the kids) walked up to the doors. Now that I’m the one passing out candy it’s nice to see parents out there giving a friendly wave and not slowly driving by in a car … which BTW is super creepy. Educational moment: At first I thought these pumpkins were supposed to represent a “ribbon”, like pink is breast cancer. I decided to look up what a teal ribbon means and 1 of the “awareness” points is for sexual assault victims. So yeah, there’s that. I had this at the beginning of my post but moved it to the end … didn’t want to put a damper on your day right off the bat. 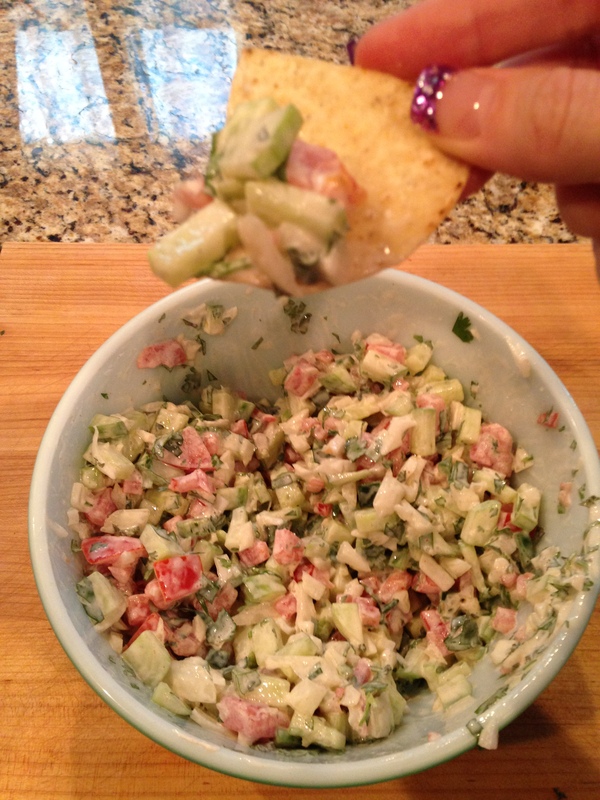 My new go-to dip is cucumber salsa – people stuff their faces and about 5 scoops in I hear “what is this… it’s awesome!”. Just note that you should really use English cucumbers. The last 2 times I have but the 3rd time I picked up regular cucumbers … let’s just say it became a soup! Regular cucumbers are full of so much water; I had to drain the salsa before serving it. Even 1 day later (I prepped the day earlier), having 2 drains, and serving it up in smaller bowls … each bowl was filled 1/2 way with liquid after an hour 😦 Spend the extra $1 and buy an English cucumber. 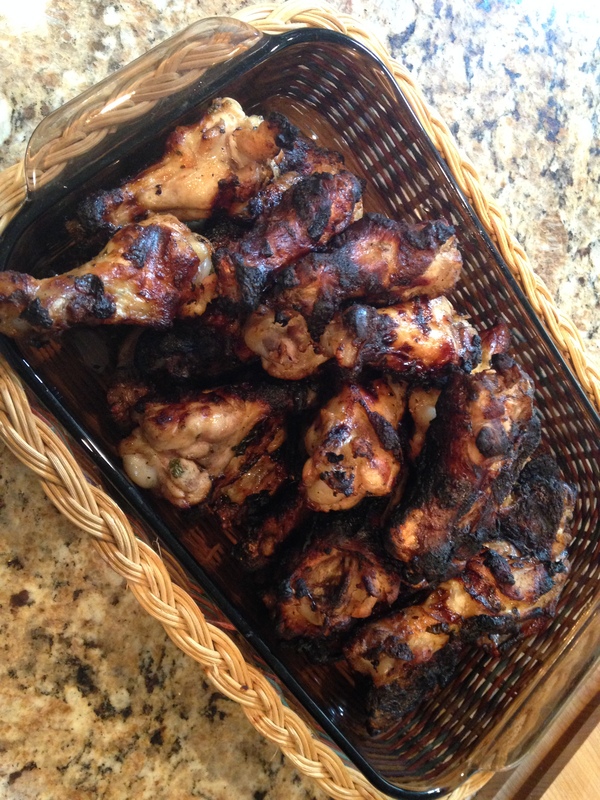 We grilled them or you can bake them … enjoy! Ahhhh, the pasta salad. It’s such a familiar dish that you don’t even have to tell people what’s all in it … all you say is “there will be a pasta salad” and you know it will be devoured. I don’t know what it is about this comfort food but everyone likes it. 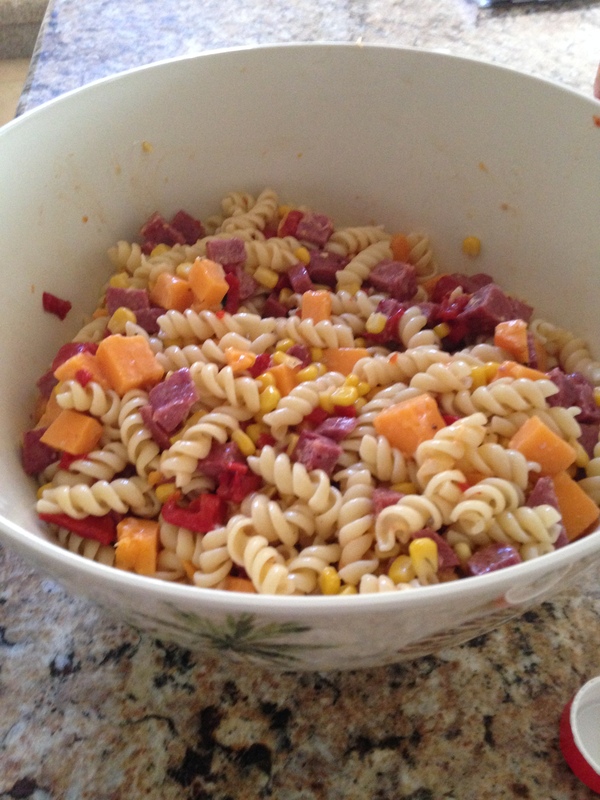 This version is: 1 box of low carb rotini pasta (Dream Fields / black box), 1 medium “summer sausage” log cubed into even chunks, frozen corn (microwavable steam bag, cook for 6 min & let it cool), 1 large block of cheese cubed into even chunks (use your favorite cheese! ), and roasted red peppers (I had a jar in my fridge already opened, may as well use them! 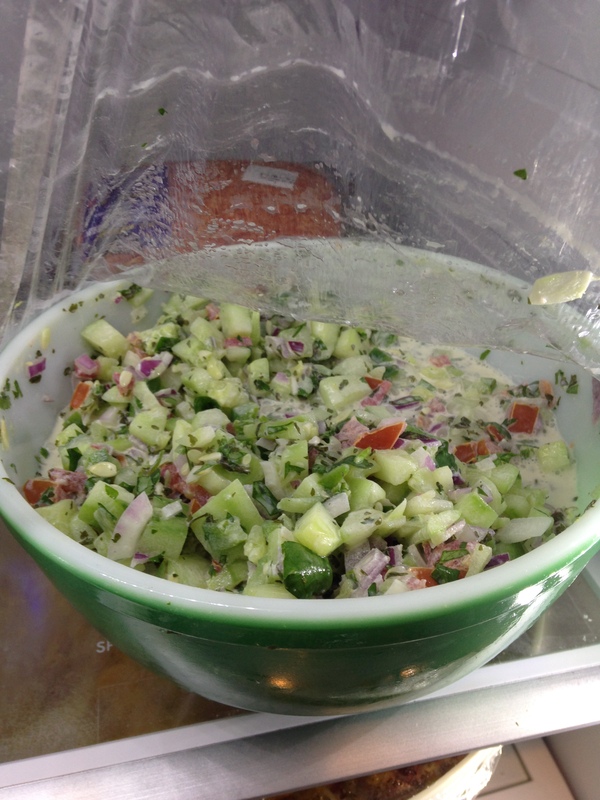 ), and top with Italian salad dressing (1/2 at prep time and 1/2 before serving it … mix well!). 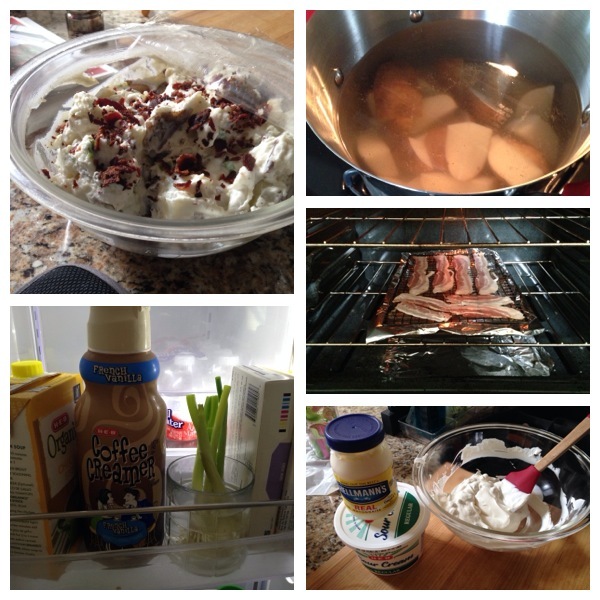 Now I’m just going to overwhelm you with a ton of photos … recipes will be in links! 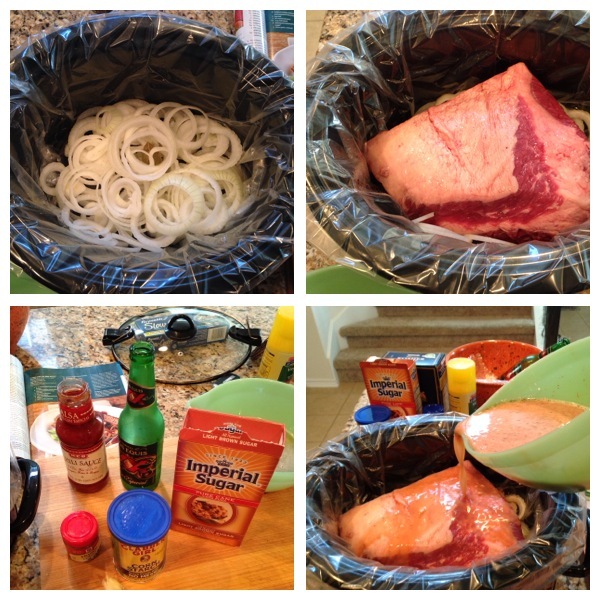 steak with french onion sauce! We have mostly red wine in our collection so I bought this cute picnic white wine cup; it was perfect for the recipe so if you are not a big wine drinker, look for one of these guys. Also have no fear if you can’t fine veal consomme … I used beef stock and it turned out a-okay 😉 Since the main dish took some extra energy (it was difficult but you have to keep your eyes on it!) I opted for canned green beans and frozen/oven baked bread sticks. 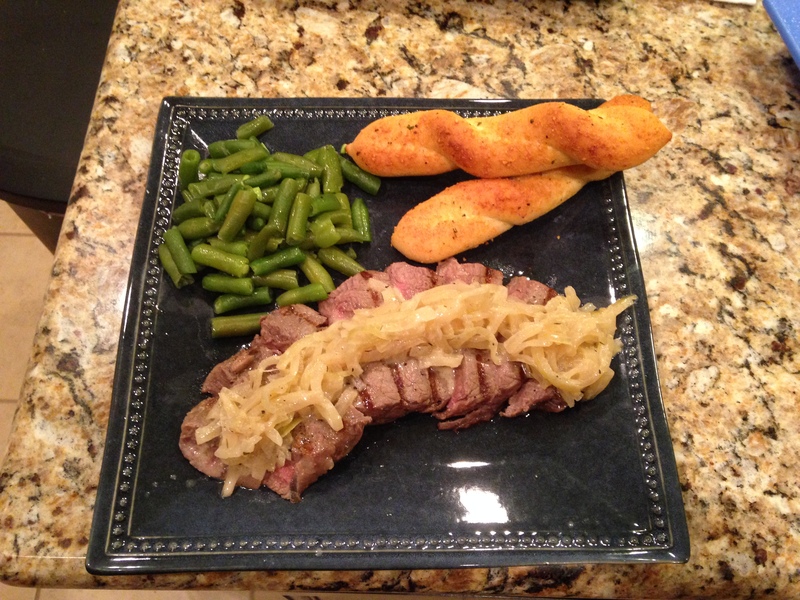 An easy meal that you could order from a steak house … at your own kitchen table, LOVE! 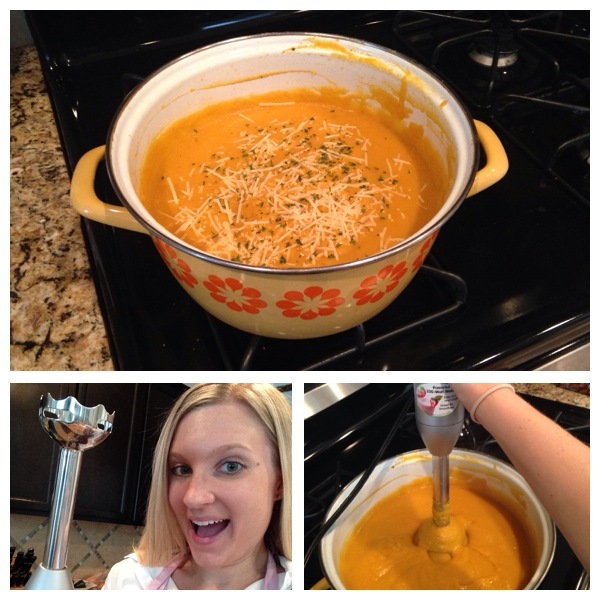 It was cooler last week and I busted out my immersion blender to whip …er, rather blend up some sweet potato soup. It’s from my favorite magazine, Cooking Light. Do yourself a favor and buy one of these guys! Rather than pouring hot things into a blender and risk burning yourself just keep everything in 1 large pot and blend together. 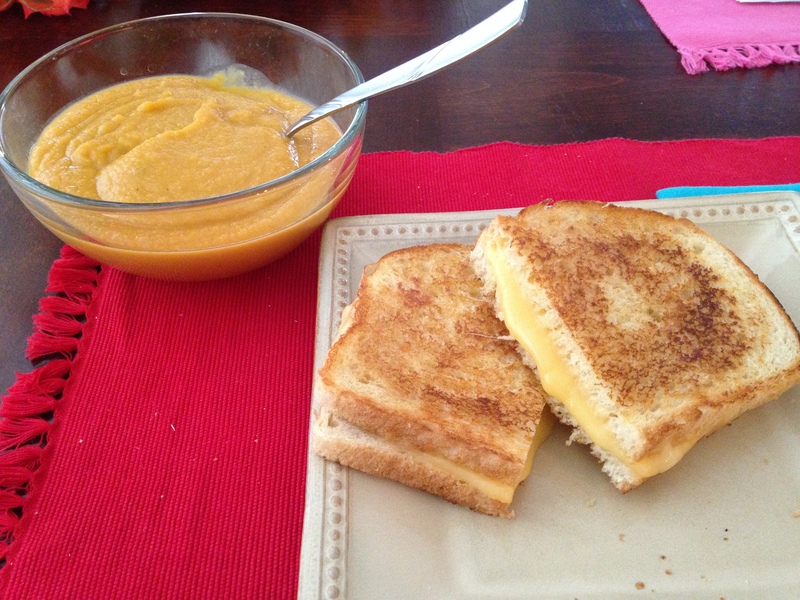 I paired a yummy smoked gouda grilled cheese sandwich and the dinner was perfect. In with the new … you don’t have to use Kraft singles for grilled cheese! I love using new cheeses each time we make grilled cheese – yes, a good cheese will cost a few more dollars but it’s so worth it as a splurge meal. 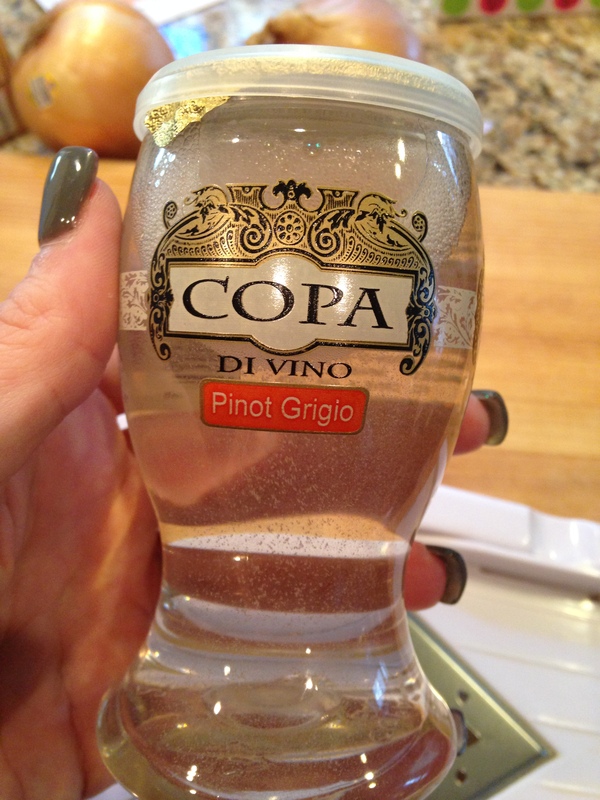 Saw this on an episode of Barefoot Contessa and it couldn’t have been easier! 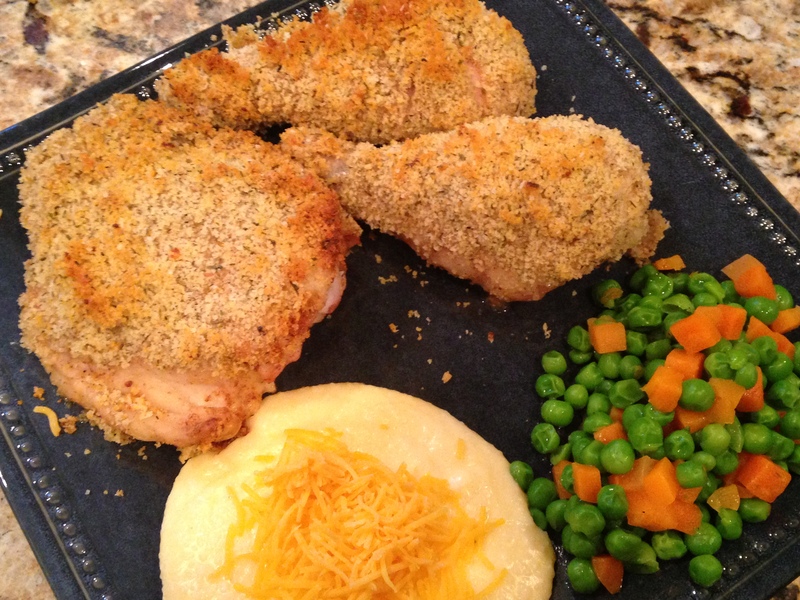 Cripsy mustard chicken and cheesy grits (again I opted for microwavable veggie since the 2 other items took some energy). Another must have gadget, I love my pint sized food processor. It’s easy to store since it’s small and it’s perfect for our family (there’s only 2 of us) however if you only want to spend $30 and have a larger family – just make recipes in small batches & combine in a large bowl, you have to dump most mixtures into a bowl anyway! The grits will need your attention as it must be stirred every few minutes as to not burn on the bottom of the pot, it is an easy recipe though. I used those ‘5 minute’ grits – just not the instant (comes in packets), you don’t have to buy anything crazy. Trust the recipe and use 1/2 & 1/2, the grits are beyond creamy. These are 2 yummy recipes you can impress your guests with … hello, holiday season is around the corner! Okay these 2 dinners are buddies … one night it was garlic shrimp & potato/onion pouches and the other was meatloaf with the same pouches. I made 2 pouches to be grilled on the same night so I could have a plan ahead dinner 🙂 Who says everything has to be cooked fresh each night?! Yeah so this meatloaf was the bomb dot com. Yes, I went there 😉 A little over 2lbs and we still have leftovers! 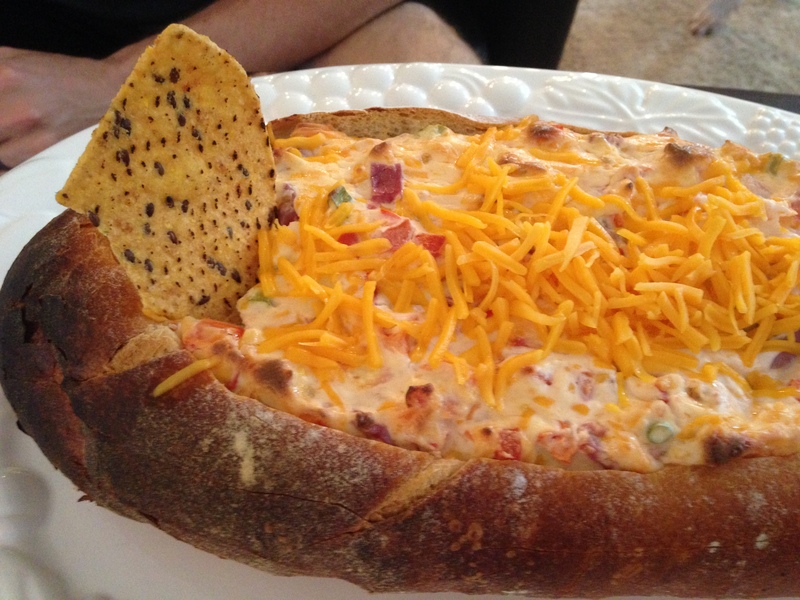 I have found a dish that has outsmarted my husband, lol! 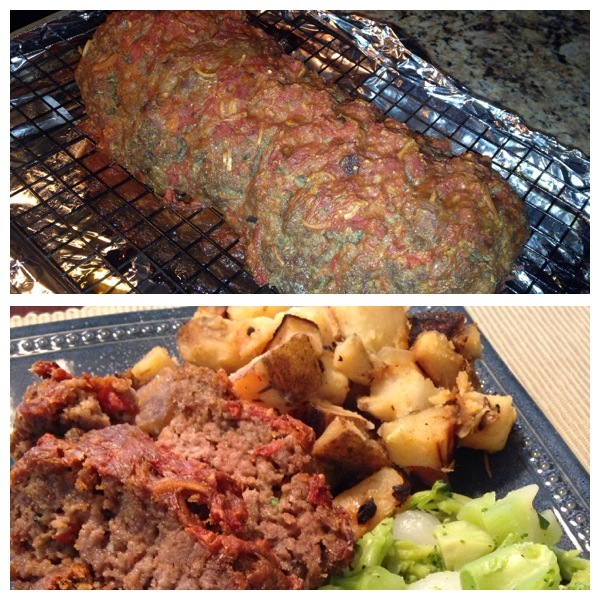 I made/cooked the meatloaf earlier in the day (Friday morning) and reheated it for dinner; I hid the leftovers in the back of the fridge so we’d have dinner for Sunday … he had no idea! Plus we still have 1/3 of it left. 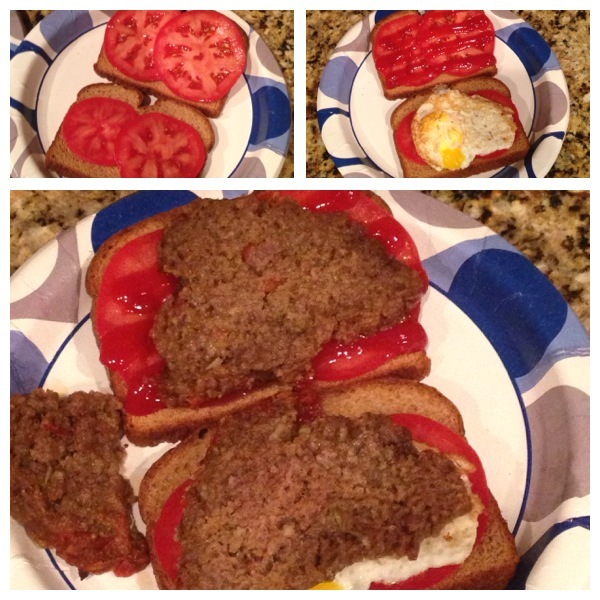 Leftovers can be fun, take these open-face meatloaf sandwiches: toasted bread, thinly sliced tomatoes, meatloaf (reheated first), a fried eggs, and ketchup or gravy. Pizza night! My husband got spicy Italian sausage and I got mild … everything else was the same: sliced red bell pepper, moz & parm shredded cheese, sauce… done. 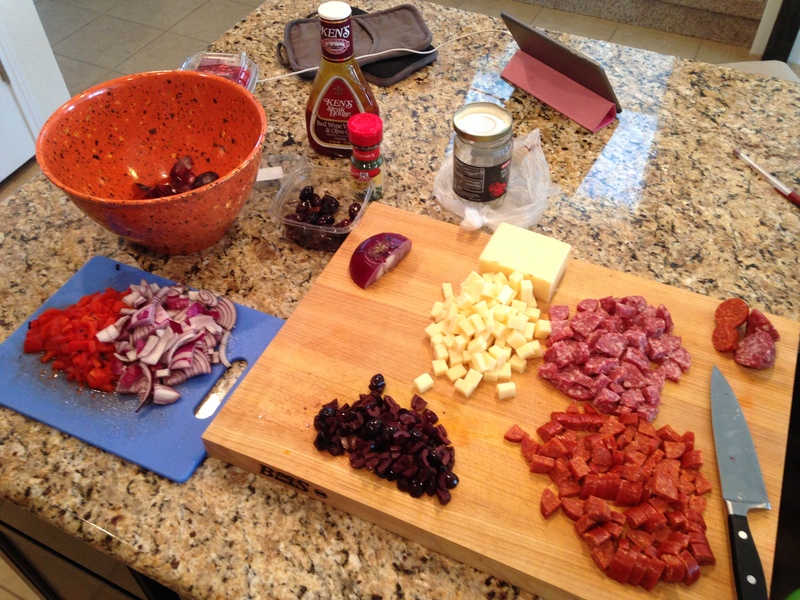 I love pizza night & trying new toppings! 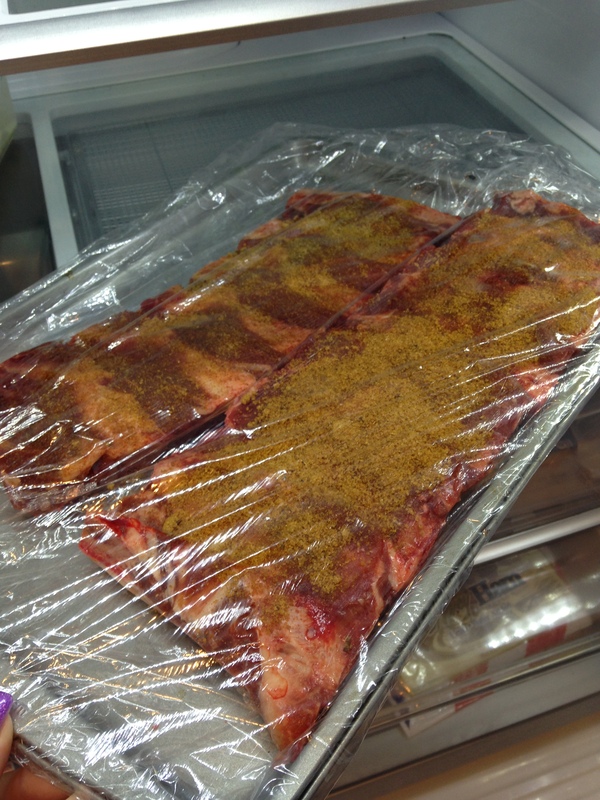 Okay this was our splurge meal last night … a 3lb brisket ($20!) which was actually a good deal but it’s the smallest guy I could find so I took it. Into the slow cooker it went and 6 hours later, dinner was ready. 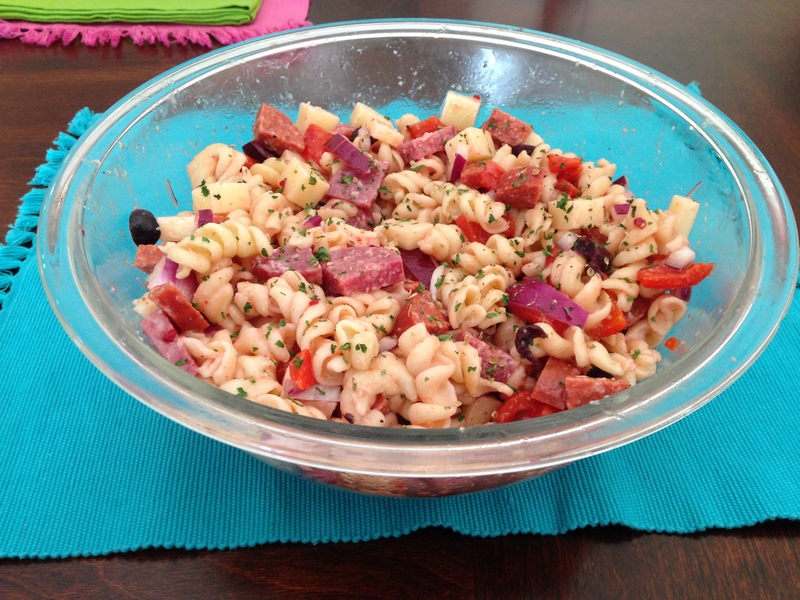 We had leftover pasta salad and veggies … I love clearing out the fridge. Simmer for 30 minutes and throw the brats on the grill to crisp the skin … pour the leftover ‘sauce’ (beer/onions) into a large dish, place grilled brats on top, and let people serve themselves. Oh, I should mention we cooked this up for a bbq (along with the pasta salad & cucumber salsa). 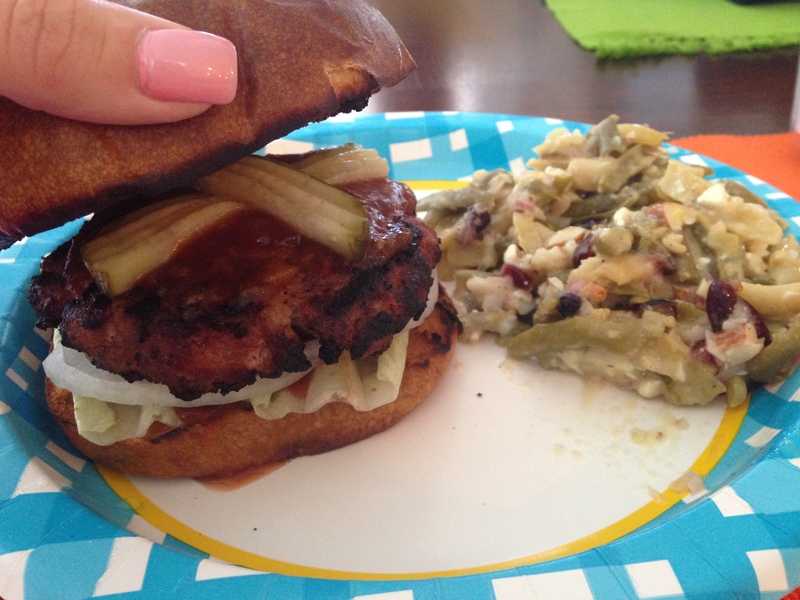 I also made burgers and they were devoured. We had 2 sausages leftover so of course we took the cheesy grits and cubed the sausages for breakfast the next day. I LOVE LEFTOVERS. It’s been a good few weeks of leftovers … It was a bigger grocery trip than usual HOWEVER we had and still have meals ready to go. Whether it’s making over a dish (meatloaf turned into sandwiches) or just throwing things together (sausages in grits), don’t think leftovers have to be boring. Same for dishes that you’ve made 10 times … try a new sauce or seasoning. Making something seem “new” can make dinner or any meal for that matter, exciting! Sometimes the best meals come to you when you’re not even thinking about … A few days ago I was getting excited about football season beginning this weekend and in the mix of things I quickly missed Pittsburgh and all of my yinzer friends. Lightbulb, peiorgies and kielbasa! Let’s pay homage to a wonderful city, beautiful friends and family, by eating a yummy meal that can be served with a side of fabulous memories. We love pierogies. LOVE. My husband will think this is silly but when we first started dating, he cooked pierogies a few times and it was ‘his thing’, no one was allowed to help. He’d be so proud of how perfectly they were cooked and would brag all night about dinner, that’s just sort of how he is but I loved watching him cook. Another bonus for this meal, I can make a double batch and freeze them for a friend who is expecting a baby annnnnny day now (hurry up little one!!). Not all delivered meals have to be casseroles, spaghetti, or lasagna. I mean can you imagine? 5+ nights in a row of essentially the same thing. God Bless people who volunteer to bring meals over (whether there was a loss in the family, a birth, major surgery, etc.) but it’s okay to turn those offers down … I know the meals are meant to be quick and easy to reheat but real meals would be nice. Anyway, who wouldn’t love homemade pierogies and kielbasa?! I know my friend will as she’s a fellow yinzer friend, friends with benefits, HA 😉 ! 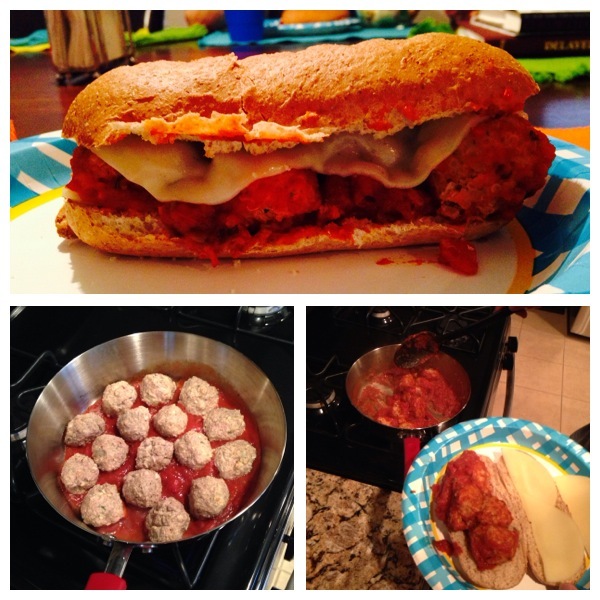 Let’s take a look at some meals from the last few weeks … I had leftovers *whhhhaaaaat?! * but made sure to revamp them. There is a ‘3 hour tour’ pasta salad, it’s entertaining, just wait. My husband also made a request and over of course I couldn’t pass it up. ENJOY! 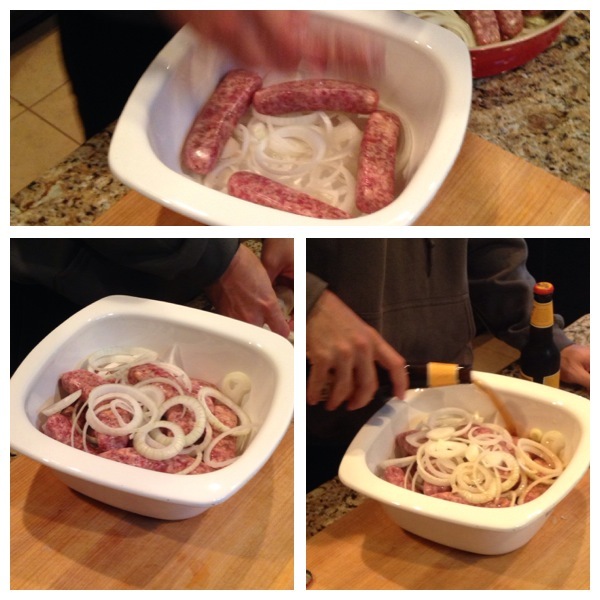 A simple meal, smoked sausages (Oscar Mayer, they are so yummy … and better for you! 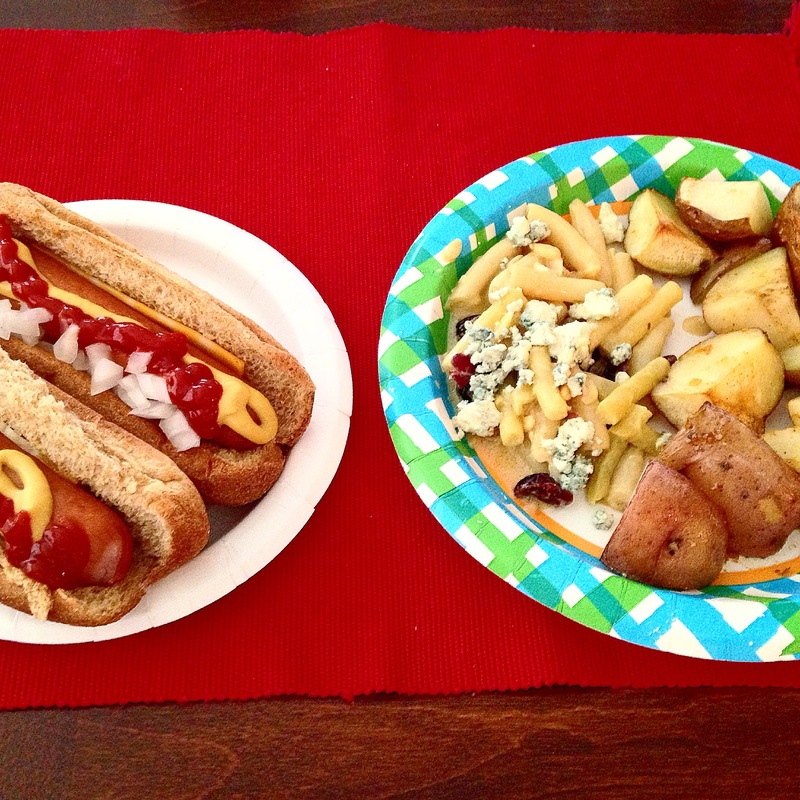 ), green bean salad, and roasted potato wedges. 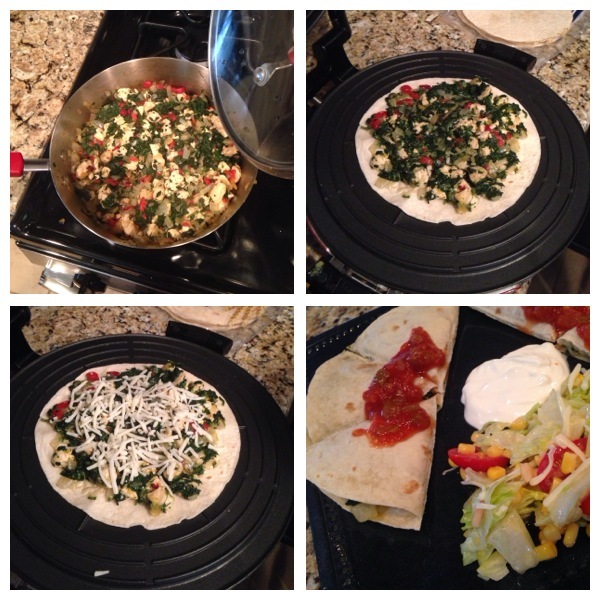 Chicken and spinach quesadilla and a corn/grape tomato/lettuce salad with Dijon vinaigrette. This was one of my revamped leftover dishes. 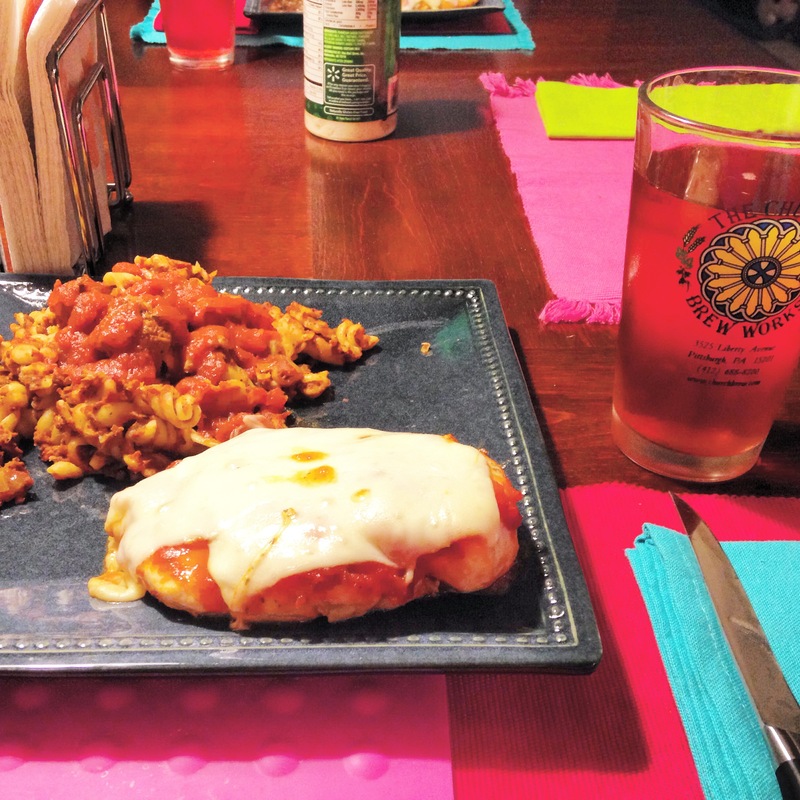 I made a slow cooker lasagna the previous week and had plenty leftover, I used it as a side dish and baked a quick chicken Parmesan. 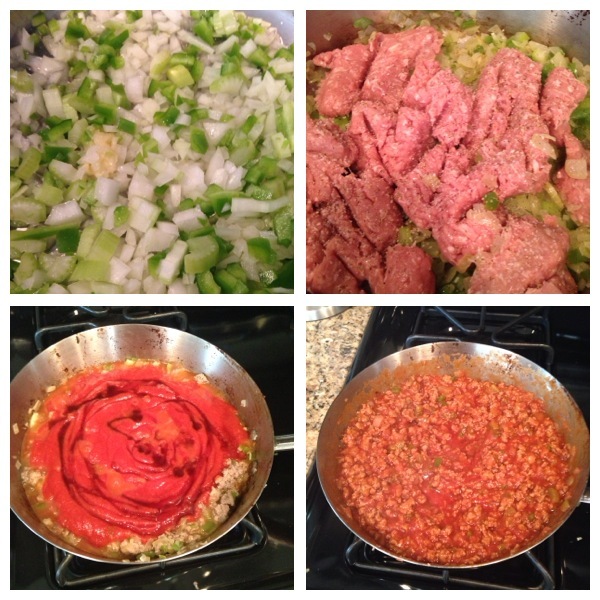 Here is the original dish – Lasagna Soup … which wasn’t soupy at all … so yeah, don’t let the name freak you out. Oh, I couldn’t find a single bottle of V8, small bottles came in 6 packs and we don’t drink that stuff so I used a can of plain tomato sauce. 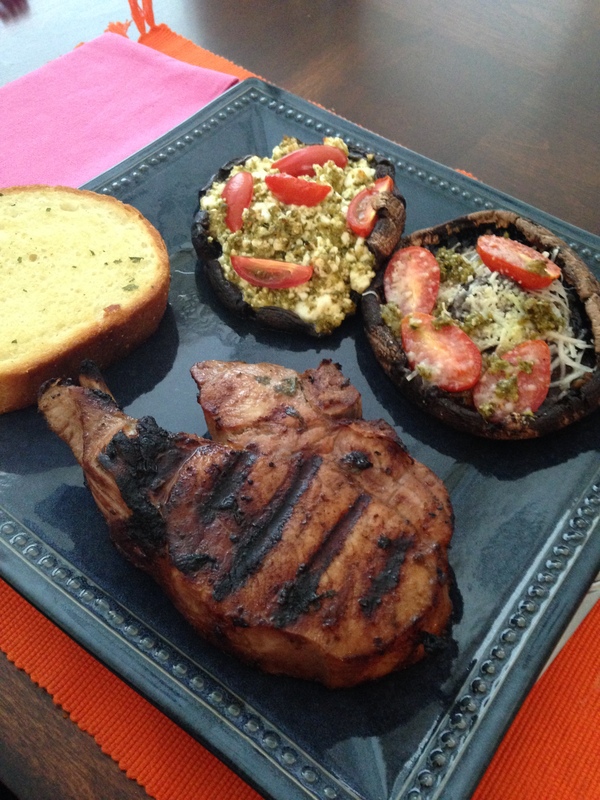 We love our pork chops! This version: honey & Dijon ‘sauce’ is the key component to pretty much everything on the plate. I coated the chop in a nice layer of the sauce, let it sit for an hour. While that was going on I pan-cooked mushrooms, bacon (already baked in the oven), and onions – drizzled more of that sauce and just let it simmer for 20 minutes until the onions were really soft. I added the chop into the pan and cooked everything for another 10 minutes, cover the pan so it steams, less splatter and faster cook time! On to the baked sweet potato which took 2 hours to bake. Really. I let my husband pick them out and of course he picked the most gigantic potatoes. As I sliced them open I went to the fridge and realized we were out of butter. Oops. No biggie, we had cream cheese and honey! 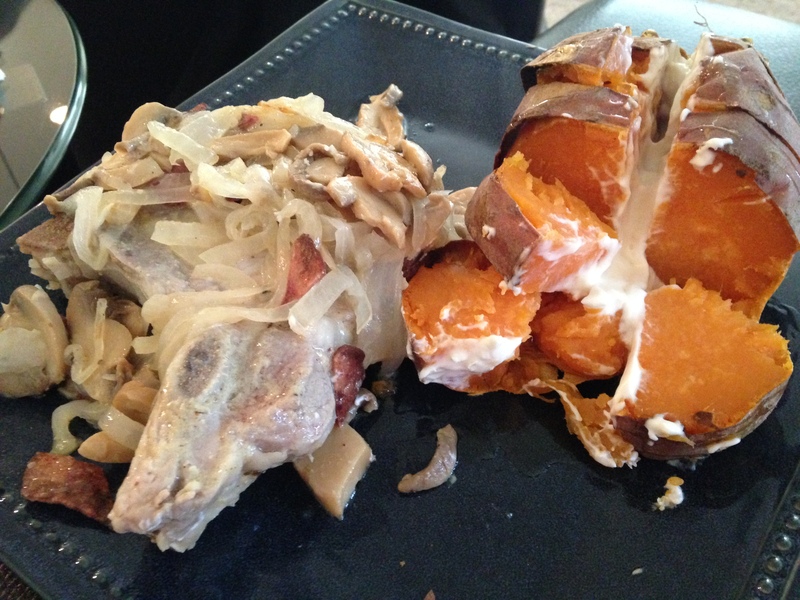 Oh it was so good… think about it, what do you add to a sweet potato casserole? 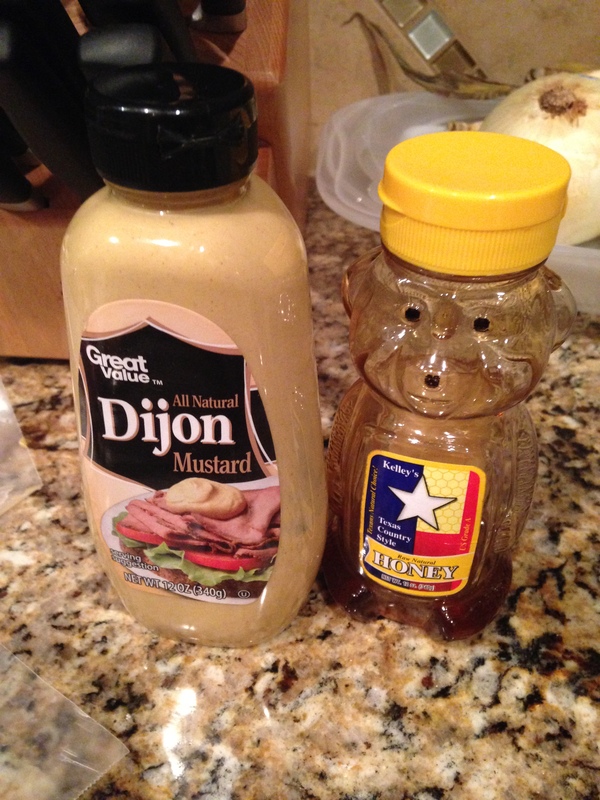 Usually cream cheese and brown sugar; we had brown sugar but I didn’t want the grittiness opting for honey instead. This is how I do corn when the husband isn’t home to man the grill. Salt, pepper, Old Bay (if you’re not from the East Coast you are truly missing out), and 3 blobs of butter. 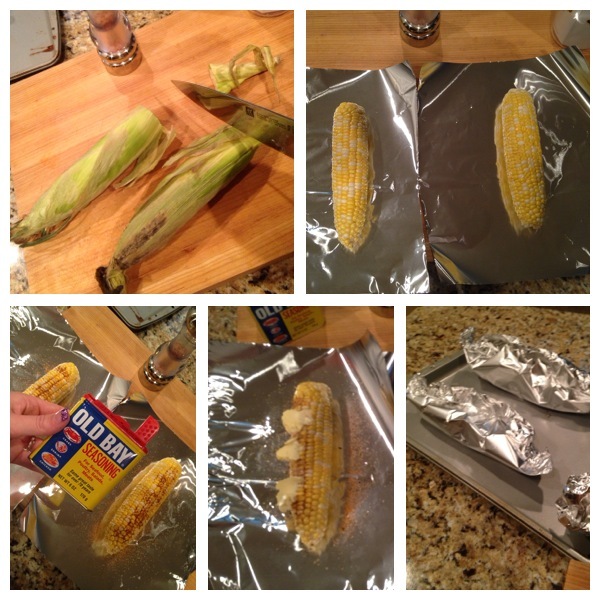 Loosely wrap each ear of corn in foil and bake for 40 minutes … I think I put the oven to 350. 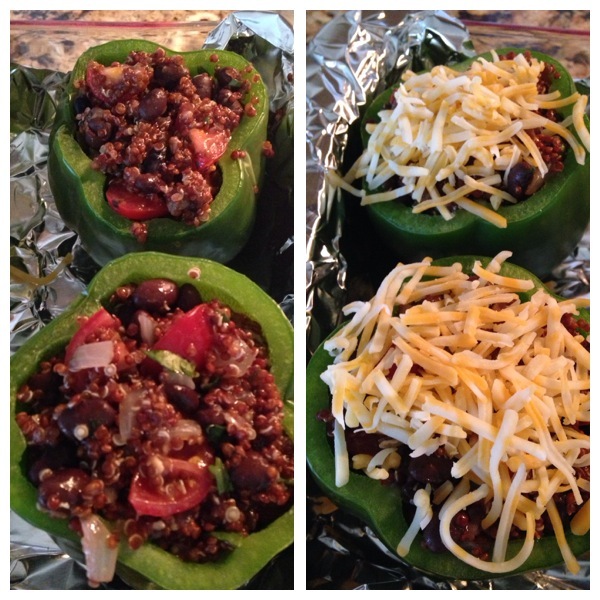 Another revamped leftover, quinoa stuffed peppers. I served the corn with it, usually I cook Spanish rice … so just by changing up the side it appears to be a new meal. So if I didn’t tell you I used quinoa it may look like ground meat; I’ve made this one other time with white quinoa and it’s totally an image thing – using red quinoa made the meal look better, closer to using meat, it’s okay to trick the brain. The color really does help! Back story on the quinoa: we got a cute ‘thank you’ bag from a friend after keeping watch on her house while she and the kiddos were out of town and the red quinoa was included. I mean talk about a thoughtful gift, I’d say she knows us pretty well! How fun is that? 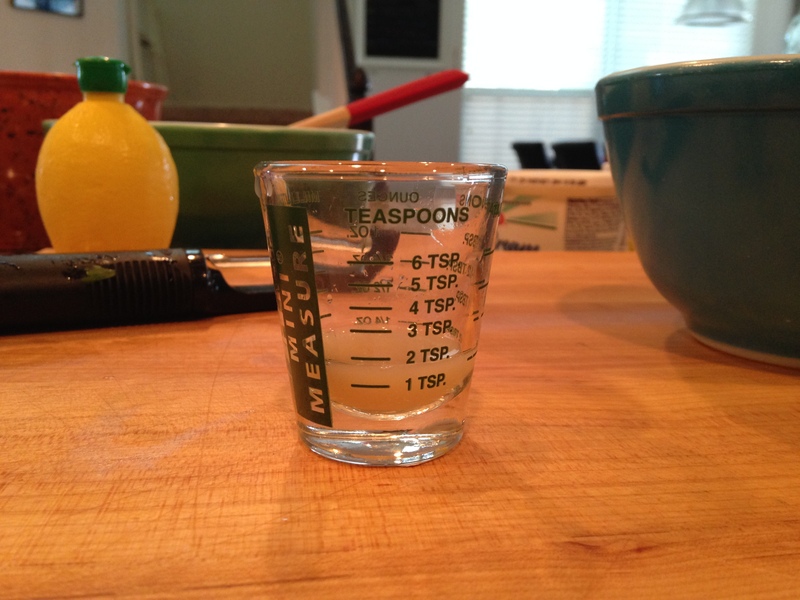 I’ve used it a few times already … so much easier than measuring spoons. I didn’t have to worry about spilling or pouring too much as I measured. It’s now best friends with my wine glass measuring ‘cup’. Greatly appreciated gifts! There are a few other things that I still need to use but I’m sure they will be yummy and fun! 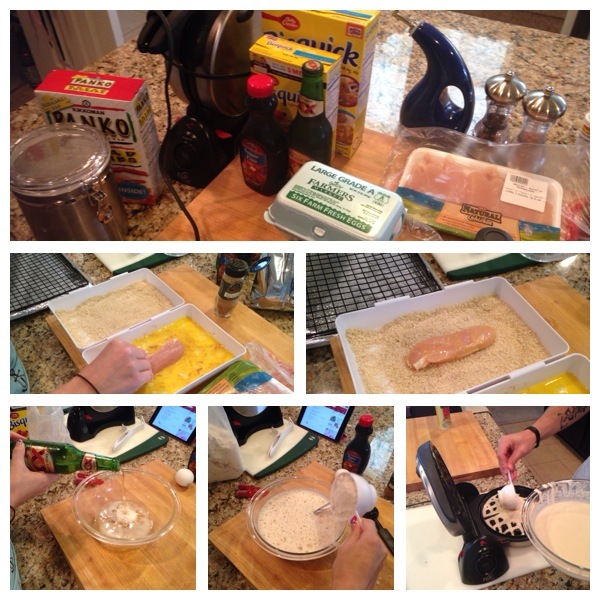 This was my husbands request … breakfast for dinner! 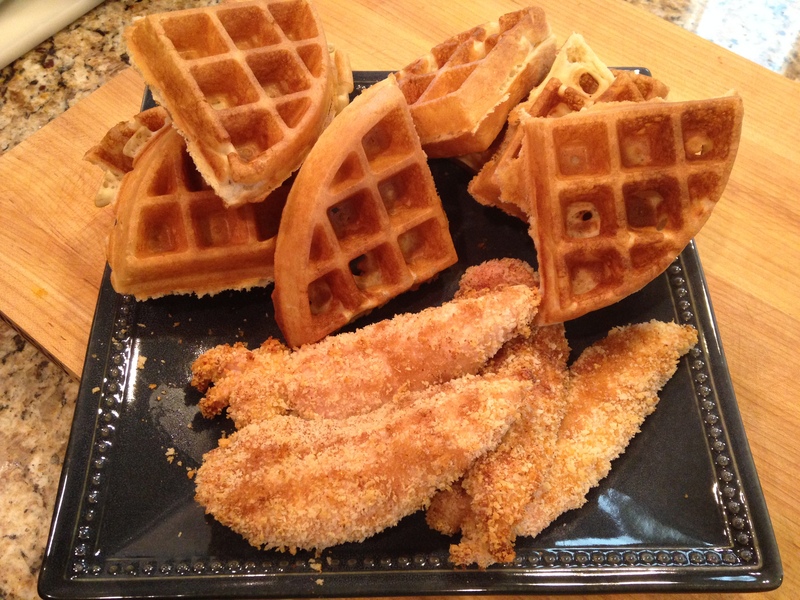 I jokingly suggested chicken and waffles and husband loved the idea, so there that is. The beer made the waffles so light and fluffy – usually 1 waffle fills us up but being lighter we scarfed down 2 waffles each! Please don’t judge. You couldn’t really taste the beer, we used Dos Equis which is a very light beer. For the chicken, I covered tenders in panko seasoned with cayenne pepper, not too much though, just enough for a tiny kick of flavor. DRENCH in your favorite syrup and dinner’s ready! Not exactly a diabetic friendly dinner but we’re allowed to cheat every now and then. I’m considering this meal for when my husband’s family visits next month, I see this being a crowd-pleaser. Tell me this doesn’t look yummy. It’s a cucumber salsa. Healthy and delish. Easy to prep and even easier to enjoy. Keep this in your back pocket for game days; nasty, greasy food is typically served up along a riveting football game. Opt for something like this! It looks like avocados but when it hits your taste buds it’ll be light and tangy. I can’t remember what I served this with, I used it as a side for dinner one night. Yes it’s okay to use a ‘dip’ as a side. AS PROMISED, the tale of the ‘3 hour tour’ pasta salad. Beautiful, right? This is only a half serving, for photo purposes only, lol; aluminum tins don’t look pretty in pictures. Back to the story, after everything was wrapped and ready to go, the salad was on the corner counter; my husband told me to get the lake house address … I went off to text my friend (my purse was in the car because we were pretty much ready to leave). I send the text and my husband gets in the car, we leave. Surely you know what’s about to happen. 45 minutes later we arrive at the lake house, I start walking to the house and my husband asks “aren’t you going to get the food?” OH SH*T. It was still sitting on the counter! I got sidetracked, thought my husband would have seen the 10lbs of pasta salad to bring to the car. Well that’s not what happened at all. He then asked if I wanted him to go back and get the salad, I said “yes” without hesitation, lol! I offered to do it since I forgot it but he’s the best and began his journey to save the salad. Friends at the house asked if anything would go back in the salad, my response: the cheese, meat, onions …everything that made the salad cost $40. That’s right, I spent $40 on a pasta salad. D’oh. It’s not like we left behind a bag of chips. So he made the 45 min drive home and 45 min drive back to the lake house, hence the newly named ‘3 hour tour’ pasta salad. It was a beautiful ALMOST disaster of the night which is okay because it was delish and all of it went. Well thank goodness … I mean, if it were out of pity then only some of it would have been consumed but not 1 noodle was left. In the end, I’m glad he went back for the pasta and thankful I have such an awesome husband. LOVE YOU BABE! I ran out of ketchup. My parents would be shocked. I was saddened by the discovery. At 3:30pm yesterday I realized I didn’t have enough ketchup to make a bbq sauce; I didn’t even have enough to make 1/2 of the recipe. I had maybe 2 TBSP of ketchup remaining and that surely wasn’t going to cut it. 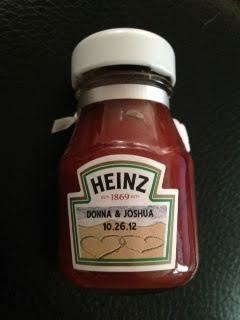 There was a day when my mother always had a back up bottle in the pantry because I literally drank ketchup. I too began stock piling ketchup, buying the mega 4 pack at Sam’s however as of lately with all of my new cooking adventures, I find myself using less and less of this fabulous condiment. I mean, to give you an idea of my ketchup addiction: I wouldn’t even touch a steak without ketchup – I don’t care if I was at home or at a 4 star restaurant. I could give a hoot about the eye rolls in my direction. I LOVE KETCHUP. My favorite dinner is chicken nuggets with too much ketchup for every bite. This is the first time I’ve ever run out of ketchup and I’m sure it’ll happen again but it made me stop and think – I hardly buy ketchup anymore, it’s not on my weekly shopping list anymore… maybe monthly if that. Wow, what a difference a year makes. 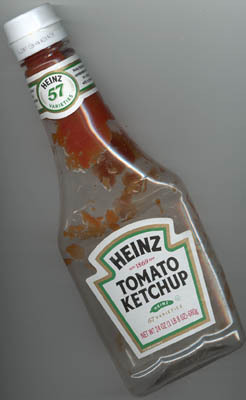 Yes, in 1 year I’ve almost kicked my addiction of ketchup. I still use it but as sauce bases or for the obvious hot dog dinner. I digress; hubby picked up an emergency bottle on the way home from work and dinner continued. Go ahead, eat with your eyes today! I’m just throwing pictures at you today … enjoy this buffet for your eyes! These next two recipes are courtesy of Ree Drummond, surprise surprise!!! She’s always in our weekly menu. 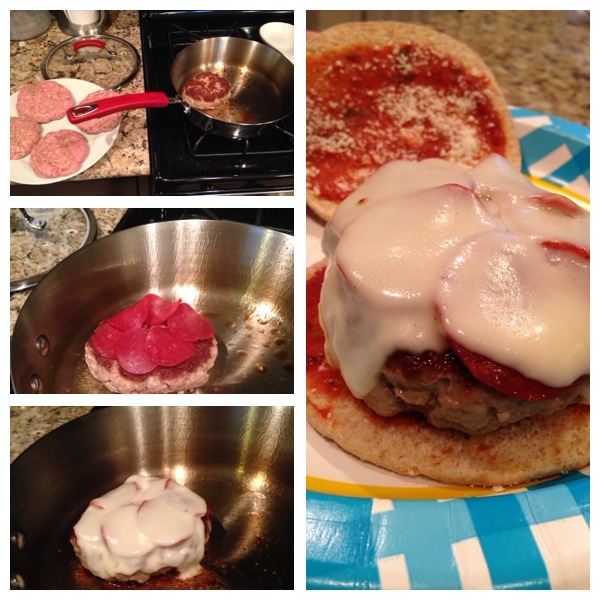 First up is a pepperoni pizza burger … how fun is that?! I figured this would be the perfect dish to make plenty of, so my husband would have leftovers while I went out of town for the weekend. I made 5 patties (I used a full pound of the ground Italian sausage); they are yummy reheated … I had the last one yesterday 🙂 Love having leftovers of my creations! It’s a one pot meal, hello! I mean, you mix the meat and whatnot but everything is cooked in 1 pot! It will get smoky cooking the burgers on the stove so throw that fan on & open a nearby window if possible. My healthy swaps: ground turkey and sandwich thins. No excuses that you can’t do a “grill out” if the hubby isn’t home; whip this dinner up on the stove and have an indoor BBQ. Second in line is a simple foil pasta dish. I thought it was weird but went with it anyway. 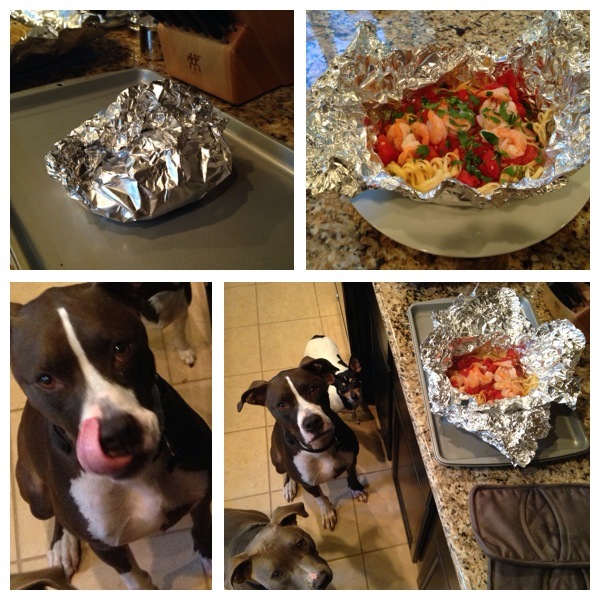 Follow the directions and TIGHTLY wrap that foil package or the shrimp WILL NOT finish cooking. Trust me. I experienced this firsthand with my husband’s dinner. I made mine first – which turned out perfectly. 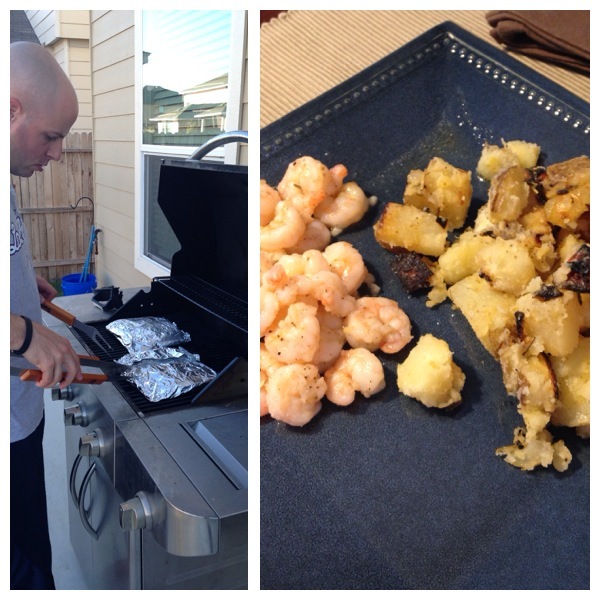 When he came home I threw his foil bundle in the oven however I clearly didn’t pay attention when I wrapped up the pasta, there was a hole at the top which let the steam out … the shrimp were partially cooked 😦 We threw it in the microwave – IN A BOWL – NOT IN THE FOIL!!! The shrimp finished cooking just fine then. FISH STICKS! HOME MADE! I can’t believe that when I put this on my menu board my husband literally thought I was buying frozen Gorton’s Fishermen … WHAT?! I got so mad! Seriously, all of my cooking adventures and he thought I was buying frozen nastiness. ROAR! He also kept calling them an inappropriate name; I won’t write it. There was a dipping sauce included in the recipe and it was GROSS – Giada, what were you thinking? Were your taste buds not working when you made it? Ok so I bought 2 BEAUTIFUL-FRESH salmon filets, my husband pulled the skin away, cut each in half, then length wise to create “sticks”. The breading was crunchy and the parm cheese had that nice salty flavor. Usually cheese and seafood don’t go together but this one worked (unlike the sauce, ha!). Oh fortunately I had some pesto (also needed for the veggie bake) in the fridge and that was a great choice to dip the fish sticks in. 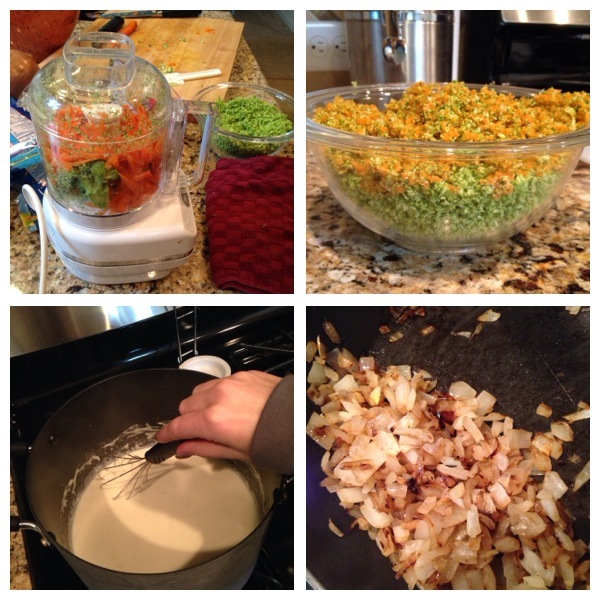 Onto the veggie bake that you see … courtesy of Instagram! YES! A fellow military spouse posted a chicken casserole she made topping the chicken with artichoke hearts, fire roasted tomatoes, roasted bell peppers, onions, and mushrooms. I drizzled pesto over the top, tossed the veggies, and put it in the oven maybe 20-30 minutes BEFORE the fish sticks; I used the same temp to make planning easier. Total cheat: I bought all canned/jarred items for this veggie bake. Sorry but not sorry, ha! I will try this again and absolutely make it with chicken breasts, maybe even on the grill. Yummmm imagine those flavors! 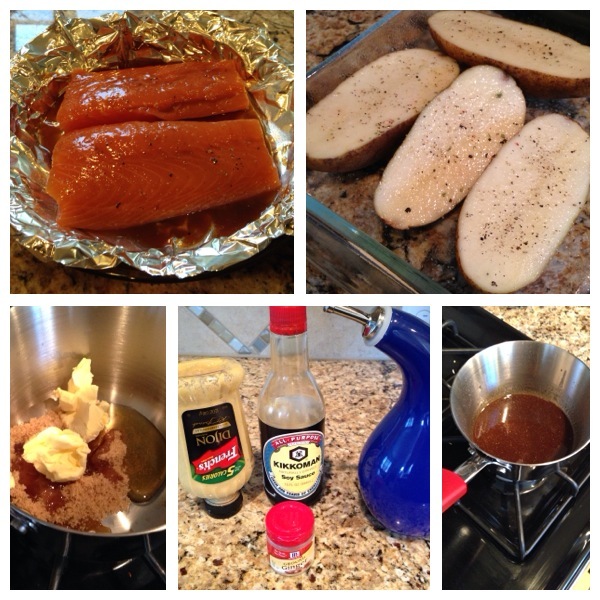 Last but not least, straight up simple salmon filets in a yummy brown sugar/honey/mustard glaze – thank you Bobby Flay. Halved potatoes so they cook faster … add a salad – DONE! 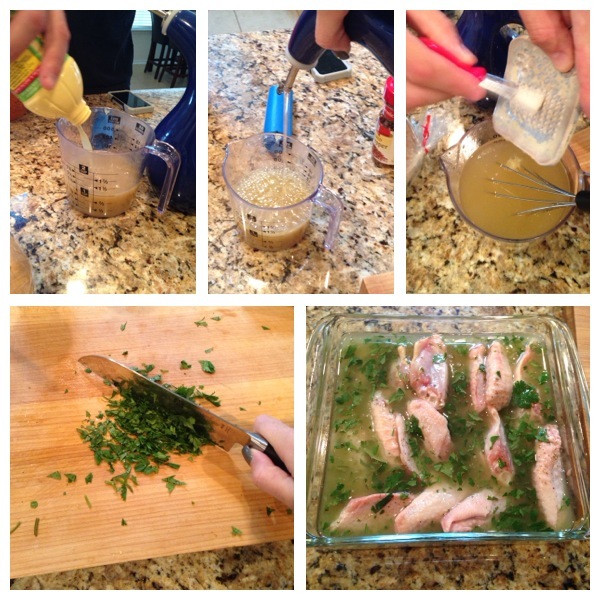 Copying a recipe : you sure can! 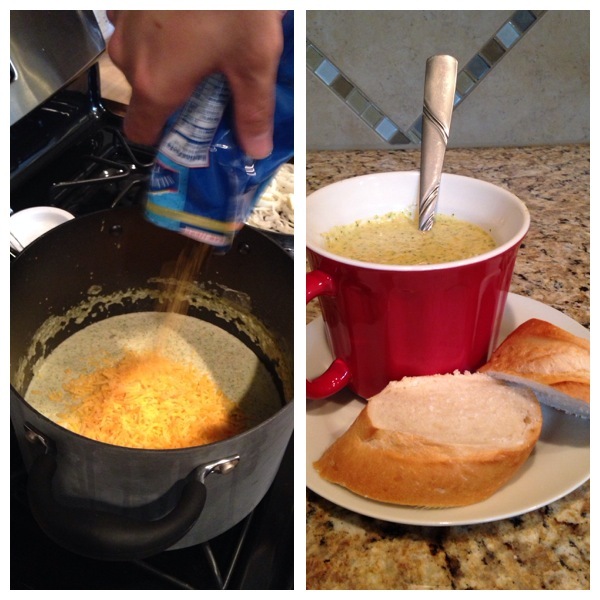 This week’s new recipe was a copycat version of Panera’s broccoli cheese soup. I’ve used this blog site before for the autumn harvest squash soup, the author is on point with ingredients. 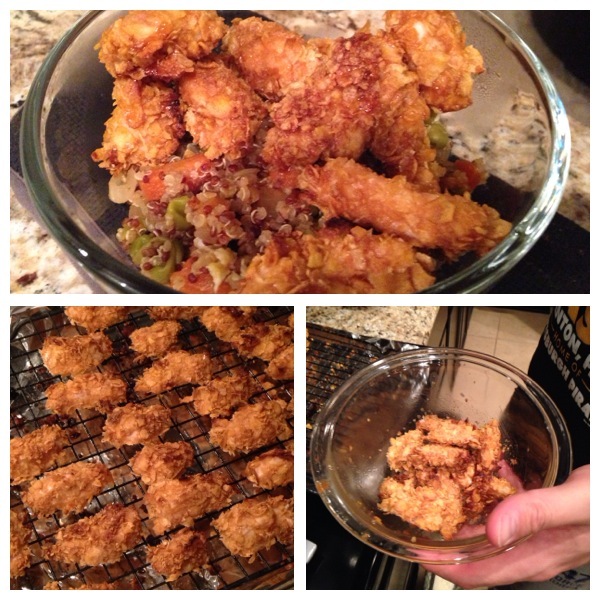 It’s really easy to make and was incredibly delish. 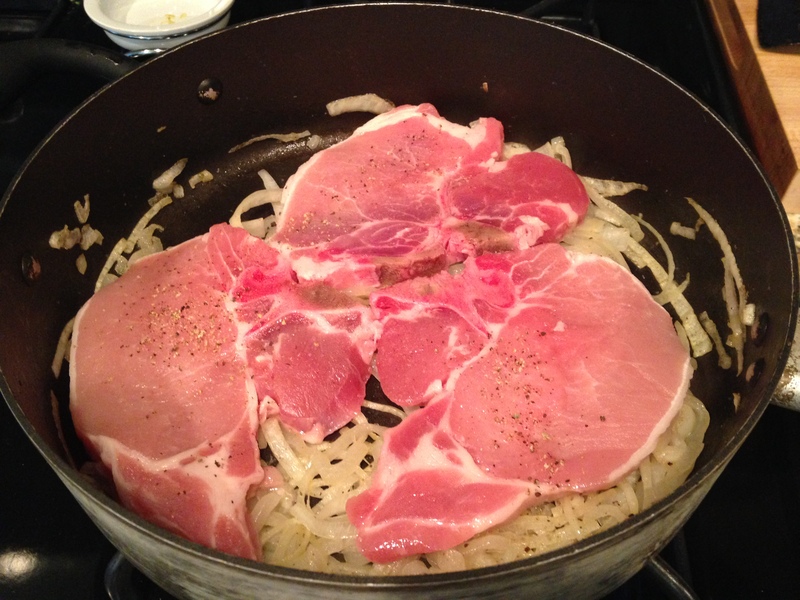 A wonderful protein to add – pork chops! Let those babies cook in caramelized onions to get some good flavors going. 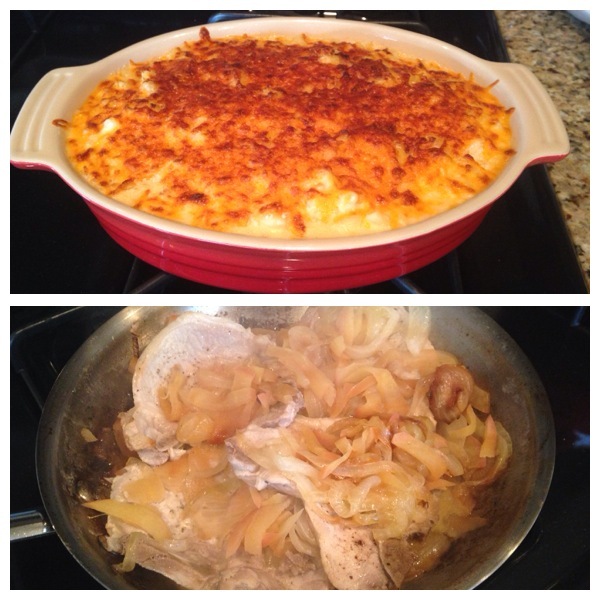 They seriously take maybe 6 minutes (once the onions begin to cook down, put in the pork chops). Hubby has been home all week for dinner! YAY! 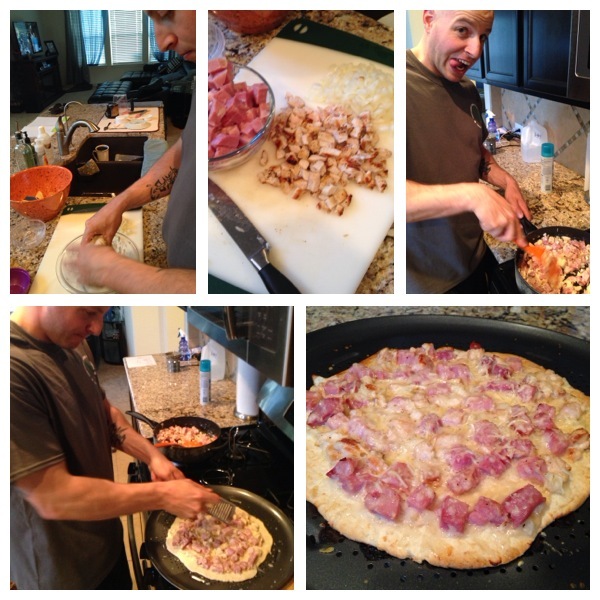 He helped on pizza night as we know it’s rare that I actually get to making dinner on Thursday’s. It’s funny that these recipes are healthy & diabetic friendly, most of you would enjoy them. You don’t have to eat like a rabbit in order to be ‘healthy’ – choose your dishes wisely and pick fresh/organic ingredients. Also, do not indulge! See how we made 2 pizzas but kept 1 for leftovers? Take note. 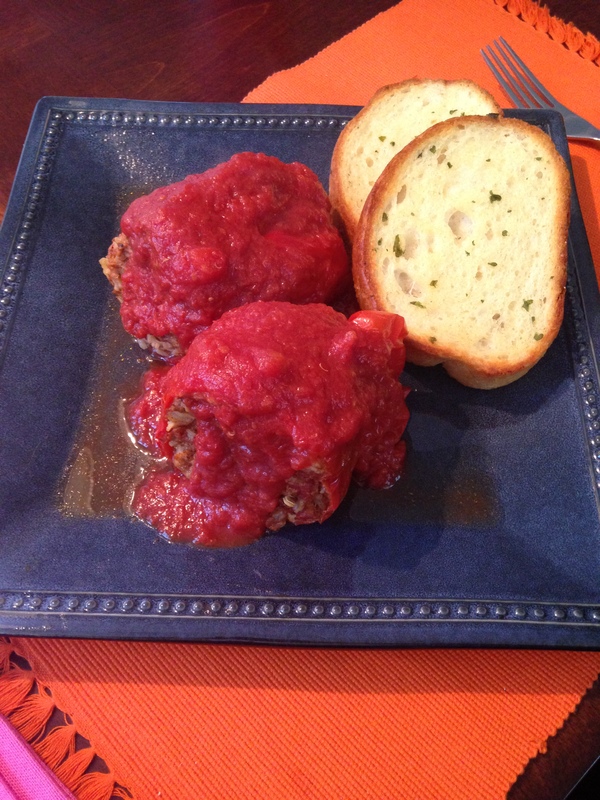 read about the tails from my kitchen: organizing, menu planning, and cooking! Because two blondes are better than one!